Adenovirus from the Infectious Pathogens collection in Lux. 3D Models of viruses, proteins, and other biomolecular objects have many awesome uses. They can be used for conducting research and figuring out problems and processes. They can also be used for teaching students what these objects look like on a magnified scale to obtain an understanding of how they’re made and how they interact. 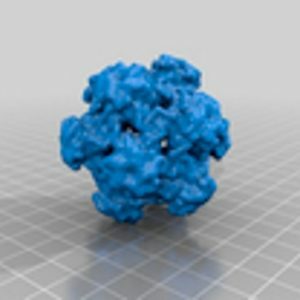 The article, “3D Printing of Biomolecular Models for Research and Pedagogy,” by De Veiga Beltrame, et al, describes the benefits of using these models, and provides “a guide on the digital design and physical fabrication of biomolecule models for research and pedagogy.” In addition to the article, they’ve produced a supplementary video. NIH 3D Print Exchange contains 3D printable files of many, many scientific models and equipment, and tools. UCSF Chimera an Extensible Molecular Modeling System: According to their website, Chimera is a “program for interactive visualization and analysis of molecular structures and related data.” It also includes documentation to help get started. Dr. Dave Hall from Lawrence University’s Biochemistry department has created collections of infectious pathogens and protein domains that can be downloaded and printed, and includes instructions on how to create these models with each collection. Just for fun (and science), the game Foldit not only teaches about protein structures and behaviors, but also provides its players with an opportunity to contribute to scientific research through gameplay! This entry was posted in 3D Printing, Assignments and tagged biochemistry, biomolecular models, chemistry, Chimera on November 15, 2017 by Angela Vanden Elzen.